Abstract. In this article, I describe baselinetable, a community-contributed command for creating one- and two-way tables of summary statistics for a list of numeric variables. 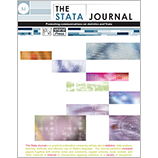 Unlike other Stata tabulation commands such as tabulate, table, or tabstat, the variables forming the table rows can be a mixture of continuous (summarized by mean, standard deviation, etc.) and categorical (summarized by percentages and frequencies). baselinetable provides considerable flexibility in the way the results are displayed. In particular, the summary statistics and their presentation can be different for each row variable. Additional features include several options for displaying counts of missing and nonmissing data points and the ability to restrict results to subgroups of the data for individual row variables. The contents of the table can be saved as a data file or text file, or they can be exported to Excel. The motivation for baselinetable is the descriptive table commonly seen in health research publications in which the baseline characteristics of two or more groups are compared. This descriptive table usually has only one column for each group, generally with at least two summary statistics in each column (for example, mean and standard deviation for continuous variables or frequency and percentage for categorical variables). The baselinetable command supports reproducible research by enabling researchers to easily create tables whose contents can be used unchanged in publications.